With a short trip to the Pittsburgh International Race Complex (PittRace) in Wampum, Pennsylvania, Top Kart USA would enter a handful of drivers in the fifth and sixth rounds of the United States Pro Kart Series (USPKS). With already a stout resume with their 2014 results, the Indianapolis based team would add more victories and podiums as they enter into the second half of the 2014 karting season. Competing in the Yamaha Pro division, Dakota Pesek continued his string of podium results as he was once again at the front of the field. Taking the main event victory on Saturday, the talented competitor proved it was no fluke by returning Sunday to cross the line in second. Killean Keaveny would also add a pair of top ten results with seventh and sixth place finishes. 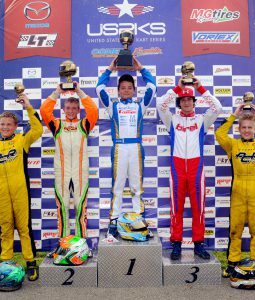 Top Kart USA would enter three drivers in the Yamaha Junior division and come home with a pair of victories. Saturday Zach Holden would stand atop the blocks while David Malukas found his way to the front of the field on Sunday after a disappointing DNF in Saturday’s competition. Holden would also add a sixth place result Sunday while Sheldon Mills would narrowly miss the top ten with an 11th place result. Pauly Massimino and Giovanni Bromante would enter the Vortex Mini Rok class and have mixed results. Massimino would back up his 11th place run on Saturday with a seventh place finish Sunday while Bromante would finish 12th and 11th respectively. Bromante would also see action behind the wheel of his Yamaha powered Top Kart and after finishing in the fourth position, was removed from the results for a non performance enhancing rear bumper rule. Owen Mahle would be the lone entry in the Yamaha Rookie class and would stand on the podium on Saturday. Coming home with a third place finish, Mahle was hoping to improve two more positions on Sunday but would fail to complete the full race distance. In the ever-competitive TaG Junior field, controversy would rule the day on Sunday after multiple top ten finishes on Saturday. Holden and Malukas would finish ninth and tenth respectively to complete the first official event day however on Sunday, several Top Kart drivers would be in the top five. With Malukas out early, Holden stole the show as weather moved into the area and secured a dominant victory in wet and tricky conditions. However, post race the top five drivers would be excluded from the results for not having an over flow bottle on their radiator. Though non-performance enhancing, the rule is in the book and was initially enforced. With outrage from competitors, families and teams, the United States Pro Kart Series reversed the technical disqualifications on Wednesday July 30th, reinstating Holden as the winner and adding to Top Kart USA’s weekend total. Abby McLaughlin would also be at the front of the TaG Junior field and would take the point during Saturday’s main event. Settling into second and pacing with the leader, McLaughlin and, with the first and third place competitors began to draw away from the field. However, on lap three, McLaughlin and the leader were taken out by a blatant maneuver by the third place competitor.